CPUMon is a simple little gadget to monitor CPU performance from your desktop. It displays a real-time graph of CPU performance as well as current usage indicator. 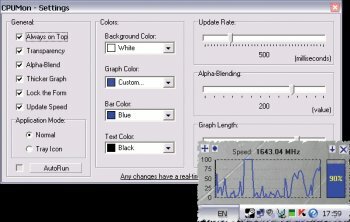 The display supports custom colors, alpha-blending, user defined update rates and more. Some of the features: transparency, alpha-blending, customizable colors, layout presets, form locking, constantly updated CPU speed for Mobile processors, plus Tray Icon mode and Statistics, can also display Memory Usage, etc. CPUMon has split up into Lite and Pro editions, where Lite is limited to non-commercial usage and doesn't have detailed processor information and statistics, but still has all of the unlimited customizable graphical cpu and memory monitoring capabilities. In regards to "smaragdus" comment. I am very sorry to hear about your disappointment, but I hope that it will be compensated by the continued development and support for years to come, rather than a dead project and complete abandonment of all products.